Our Kite Workshops run for approximately one and half hours. We give the students a brief history of kites and cover the basics of flight and aerodynamics. The students then fly our kites that are all different shapes and sizes, diamond, deltas, box kites, sharks etc. We finish the session with each student making a paper A4 kite that is 'guaranteed' to fly. We have been taking students through our kite workshops for 20 years and adapt sessions to suit all year levels K-6 and for a variety of Learning Areas. Please let us know if you want a specific area highlighted. For High School students we often work with TAS or STEM students. For the younger groups we concentrate on telling stories and the fun of flying kites. For years 5 and 6 we get more into how and why they fly. 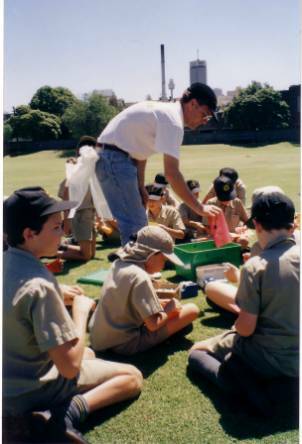 We need a large open area preferably a school oval for the workshop to be successful. We will start the workshop in the classroom and then move outside to fly the kites. All the students get a chance to fly at least a couple of kites. We limit class sizes to 30 students so that they all get a fair go and we avoid to many tangles! If a school has two or three classes we will run up to three sessions per day. In the event of wet weather the school needs to ring me on my mobile and we can reschedule the workshop. There is no cancellation fee. If you need more information or would like to make a booking please call me or send an email to info@kitesite.com.au.